Over a decade ago we invited some new friends from the autism community into our home, with no idea that TACA would be born from that single decision. Our world had been rocked by autism and we were starving for friends who understood our “deer in headlights” gaze. We also wanted to share what little we knew and learn from others. A decade has flown by in the blink of an eye and I marvel at what TACA has become. Back in those days folks drove 3-4 hours to come to monthly TACA meetings. At the time, TACA was just a shared idea in my living room, not quite an organization. Days after celebrating our first TACA anniversary, I began to receive calls and emails from people asking to establish a TACA chapter in their town. A chapter? A franchise? A location? What??!!! I wasn’t ready for these calls and neither was TACA. Over time some of these new friends were able to talk me into the chapter concept. Those folks were Moira and Michael Giammatteo in the valley (dude!!) followed by Cherri Cary and later Becky Estepp in San Diego. We had bonded and I trusted them so when they said they were ready to launch in their communities, I gave the green light. In 2001, TACA Los Angeles and TACA San Diego were launched. Over the next few years, phone calls and e-mail requests came from all over the U.S. and from as far away as Canada, Italy, Japan and other places known only to me as a point on a map. Since those early days, 22 additional chapters were formed throughout the US. Hundreds of volunteers have graced TACA with their gifts. Don’t get me wrong, there were and are other organizations focused on autism – research, political advocacy, education and more. TACA was created to educate, empower and support parents and provide them REAL HELP NOW – and parents keep coming in droves. As our chapters grew, we began to get more organized. We created a Volunteer Coordinator guide to assist our amazing parent volunteers. The Guide is always a work in progress with changes and additions based on the ever changing information about autism, the needs of our coordinators and the requests of the more than 27,000 TACA families we serve. TACA established our first Leadership conference in 2007 to continue our sense of community for our hardworking volunteer chapter coordinators. We gather together to brainstorm, re-energize, explore best practices and work towards our common goal: helping families lead their children on the path of recovery. The 2007 Leadership conference featured 10 people. In 2011, our conference had grown to more than 60 people with 18 states represented. It is through their commitment to our mission that we could heed the call of “more TACA.” Without them, chapters could not exist. I love the Leadership conferences because for three days I am surrounded by the heartbeat of TACA – our Volunteer Coordinators from throughout the country. Often I wish we had a big housing tract so that we could all live on one big block, our children playing in a protective TACA neighborhood bubble. I love these people beyond words and appreciate what they do. I admire how we stay connected though geographically we are spread far and wide. And I LOVE the friendships and the bonds we carry in this fight to get and keep our kids as healthy as possible (another topic for my next blog). I can hear their voices and laughter in my head, even when they are far away doing good TACA deeds in their faraway TACA chapter land. Equally as important, I carry their words of encouragement during the tough days. Their voices are sweet music to my ears. 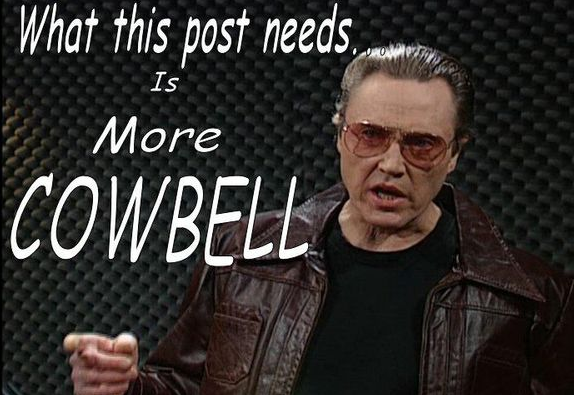 The only thing TACA’s music needs is….you got it….more cowbell!! Love you and what you do Lisa! The cowbell skit is one of the funniest skits I have ever seen. Especially Christopher Walken. I loved how to you tied the story together. Lisa, thank you for all of the work you have done for the rest of us.